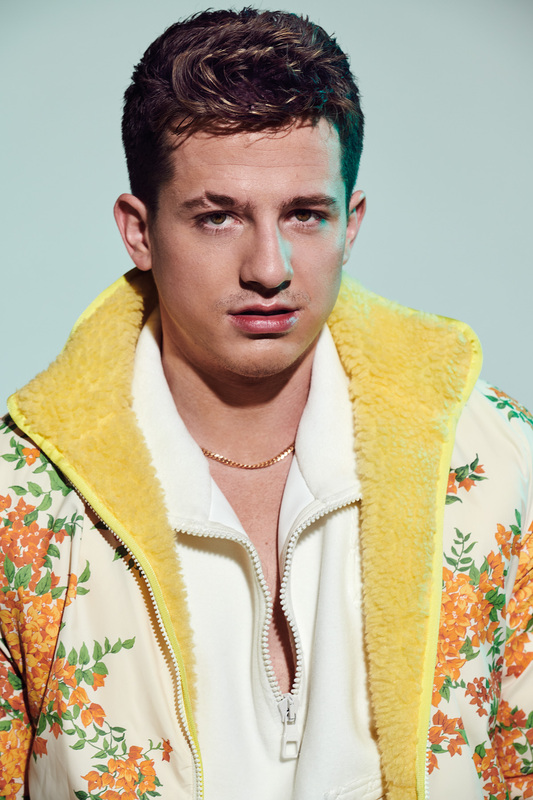 On the surface, Charlie Puth might seem like your typical, run-of-the-mill pop star. But, have a conversation with him and you’ll realise he’s incredibly serious about his music. Puth burst onto the scene in 2015 with his guest feature on Wiz Khalifa’s ‘See You Again’, which hit number one in America. Buoyed by the sudden influx of fame, he rushed out his debut album Nine Track Mind, a sappy record that Puth admits was not him. So he took his time with his second album, Voicenotes, and what a record it was. Puth also wears two other hats, that of a producer and a songwriter. Not bad for a 26-year-old. Before his third record comes out, we sat down with the music prodigy to talk music, strange chords, and nice watches. What was it like growing up as Charlie Puth? At four, I started playing classical piano, then jazz when I was 10. I was playing in my church, hearing the same music over and over again, when I figured out that I had perfect pitch, meaning I could hear it once and then play it entirely from memory. Not a lot of people can do that. In fact, I think only one per cent of the world’s population has this ability. Also, growing up, I always appreciated pop music as well. How did it work though, going from classical to jazz and to pop? When I was studying at the Manhattan School of Music, all the jazz heads thought it was crazy to also study classical. It was a segregated world. I think I was one of the first in the pre-college programme to go over to the classical world, and be a classical piano minor and a jazz major. But I realised that all those different genres of music are married to each other, whether they like it or not. If you listen to ‘Kind Of Blue’, the best-selling jazz record of all time, by Miles Davis, you can hear melodic structures similar to the likes of Luther Vandross and other R&B acts. ‘Take My Boo’ by the Ghost Town DJs – Dmaj7, Db7, F#m. That’s a minor II V I chord progression, which has always been in jazz music. I found it in R&B as well, and now it’s in pop music more than ever. Has your knowledge of classical music helped you throughout your career? It helps calm me down. I forget to listen to Mozart sometimes, because my life is pretty stressful, and it’s nice to just put on Sonatina in C major. It’s interesting because Mozart music is by definition easy to listen to, but it has some of the most complicated pieces to play because he was such a genius – it’s so sparse that if you mess it up, people will hear it. It’s like pop music for its time. So, whenever I make a melody, I try to make it as universally approachable as possible, and I think that’s what he was doing during his era. When did you realise you wanted to make music as a career? My mom used to film me as a toddler and I saw videos of me singing as early as three or four years old. I always loved how different melodies would make different people react a certain way. At four years old, I would sing ‘Cheeseburgers in Paradise’ by Jimmy Buffer — one of my favourite songs ever — in its original key, which is D major, not knowing I had perfect pitch yet. But when I would sing it in a different key, changing it on purpose for a group of my parents’ friends, it would get different reactions. I’m still obsessed with that, how people would react to different arrangements. I used to bring my beat pad to church. There was this one Gregorian chant that is always played during Mass and I always thought it needed a bit of groove because it was so stiff. I’ll never forget all the churchgoers looking up at the roof, thinking, “What’s going on? It’s always just organ and singing!” [laughs]. It varies. Phil Collins was and still is the king of taking classical melodies and writing songs. Like ‘Groovy Kind Of Love’, which is actually a Bach fugue in G major. Of course you can use it because the copyright has expired. I had never heard a pop artiste do that at that time. His band Genesis also had classical influences. Absolutely. Everyone craps on Genesis, but I love the fact that the drums are so upfront on those records. I’m a fan of anybody that has classical influence in their pop music without making it sound like a classical piece. On the other end of the spectrum, in 7th grade, when I heard ‘Rock the House’ by DJ Jazzy Jeff and the Fresh Prince, I learned how to beatbox. And I was influenced by Scott Storch and all those early 2000s hip hop records, people such as Mr Collipark and Just Blaze. Talking about hip hop, there are some people who think it has no melody. How would you defend the genre against this type of statement? I think people have been trying to break the mould of melody in hip hop for a long time. People used to crap on Ja Rule for singing in his songs. I think 50 Cent and him had some beef because Ja was singing in his rap record. He wasn’t the first to do that, though. 50 Cent ended up singing on his album too. It was off pitch at times, but when you double your voice it becomes more in tune. You have perfect pitch so it must really irritate you. No, I can switch to another mode of appreciation. Even though 50 Cent was off pitch at times, it was less about that and more about the vibe. When he’s singing on ‘P.I.M.P’, it just goes with the music. Like when Nate Dogg used to sing – God rest his soul. He had a better voice, in my opinion. He would sing slightly off pitch but it worked really well with the Rhodes keyboard and all the instrumentation. In my opinion, there’s been melody present in rap since the Grandmaster Flash days, since RUN D.M.C. and Ice T. Even in today’s mumble rap culture, there’s still some melodic structure to it. There’s melody everywhere! I read you were already writing songs in high school. Yeah, I was, but not very good ones. I don’t give myself too much credit. What did you do with those songs? Your dissatisfaction with your debut album Nine Track Mind is well-documented. If you could turn back time, how would you have dealt with the production and release of the album? It’s not completely true that I’m dissatisfied with it. I mean, I totally am, but ‘We Don’t Talk Anymore’ is one of my favourite songs I ever wrote, and that’s on that album. I love ‘One Call Away’ too. Well, I guess I am, I don’t care. I wish I had a little more of an identity. And now I do, so onward and upward. When did you finally get the lightbulb moment, or the impetus to break free from those chains and become your own person? Now, fortunately enough, because of some clever moves, the message is loud and clear. For a while, I was seeing my face in too many tabloids and I didn’t like that. Well, being famous rocks. It’s awesome actually. It’s great getting first in line to some things. I’m not going to pretend it doesn’t happen. But, I can’t go to some of my favourite places anymore. I used to put my headphones on when I first arrived in Los Angeles, and go to The Grove shopping mall. I can’t go there anymore. I also can’t go to The Commons in Calabasas anymore nor certain restaurants. I know my life is fantastic, but I just have to be more cautious of who I invite to my house and who I surround myself with because I’ve made mistakes in the past, unfortunately. Like everyone, I’ve learned from them. At the end of the day, it’s all about making music, and that’s truly the thing that makes me the happiest. How does your role as a producer differ from your musician and songwriter hats? I simply put a different hat on. Like the other day, I had an artiste at my house and she said she wanted to make a certain type of record. She says a sentence and I pull up a drum break, chop it up in Pro Tools and put some chords over that. What I have my songwriter hat on, I’ll talk to the artiste and figure out how to explain musically what he or she is trying to say. Do you also get involved in the singing? Or do you coach them? Oh yeah. They naturally have their own way of singing, I’m just there to give suggestions. For example, instead of singing E to C, I would say, “Don’t do it so straight, do a little bend on the E, like almost E then F to C.” It’s less robotic that way, and more human. I have my own way of singing, and sometimes the artiste won’t copy me, but they’ll mould their voice to my voice and we’ll get this cool hybrid. Outside of music, what do you like to do for fun? I know a lot about cars. I pretty much watch every episode of Top Gear and Jay Leno’s Garage. I have an Aston Martin, which I love very much. I don’t know much about the technical bits of cars but I love and appreciate the details. For example, the 1991 Mustang GT wasn’t the best looking car, but it was a great drag racer. Little quirky details like that. Do you like watches too? I’ve seen a couple of nice luxury timepieces on your social media feeds. I like watches that make me remember a significant time in my life. I got my first watch when I turned 25, and it was the most amount of money I had put on my credit card in my life. My dad almost had a heart attack when the dealer said the price out loud. I had been through a lot. I got a record deal, travelled around the world, and survived the process. So, I got it as a birthday present for myself and had to drive all the way to Philadelphia to buy the final piece. Every time I look at that watch, I think about what’s next and where I came from. I got another watch when my second album came out and the song ‘Attention’ was travelling up the charts. I guess I do like knowing what time it is. Fitness seems to be a big part of your life now too. Tell me more about your routine. I have a great trainer who doesn’t believe in exerting yourself too much. I just like to look good. And if I feel that I look good, I make even better songs. How would you describe your music to someone who’s never heard of Charlie Puth before? I would describe it as “feeling” music. I don’t write anything down. When I write a record, I just blabber into a microphone. Yes, I totally could. I went to school to learn how to do it. I’m just probably not very good at it anymore. I write music off listening to people’s conversations. People don’t even know they’re really good lyricists. The lyrics “we don’t talk anymore” was from a conversation I overheard. When can we expect your next album? I’m working on it. I’m in the position now where I don’t have deadlines. I’m just going to make something that makes me happy, and when it’s done, it’s done. Photos by Eric Ray Davidson Styling by Jenny Ricker Grooming by Kim Verbeck/The Wall Group Special thanks to Cool Hunt Inc.